Elle! I’m alive! I’m having a blast. I’ve extended my stay in beautiful Brazil. I’m actually heading into the Amazon with a mission group. It’s a bit of a last minute decision, but I think it’d be a great experience for me. I’ve also decided to follow end my trip in the Philippines. The mission group I’m going into the jungle here has a team in Mindanao (spelling?). I told the team leader here in Brazil about your dad and asked if their team’s run into GMA, but he said he’s not sure but that the team leader in the Philippines would know. So, it looks like I’ll be in your birth country in December 2015/January 2016. Isn’t your birthday in January? I think I remember you saying something about it or was that just my imagination? Any way, the Brazil team leader said he’ll reach out to the Philippines team leader about my signing on with their team for the Christmas mission. Music wise, lots of new fiesta music down here in SoAm, and I’m loving every drop of it. Makes you get up and dance. I realize that I did forget to pack something for this trip…. I don’t have my recorder, and my phone doesn’t have a recording feature. Oops! Before I forget, I tried g.pig in Peru just for you. It was like eating a meatier squirrel. I had to ask my server to take off the head though. I couldn’t handle looking at the skull. You wouldn’t believe what he did! Apparently, there’s juices (not the brain, I don’t think) in the skull, and he was sucking that stuff down. I had chills just watching and hearing him do that. Nope. Not for me. Wish you could’ve experienced that. It was good. I love the spices and herbs they used to cook it. It was boiled before roasting. Who knew boiling in herbs and spices before roasting would really make meat that awesome…. you probably did, and I bet you do it when you cook. I’m learning! I’ve dabbled in a few environment poetry and situational poetry, and while I’m not used to writing poetry without music, I think you’ll like some of them…. especially the one I wrote while at Machu Picchu. As a fellow traveler, you MUST (and I do mean MUST) go there. It’s such a breath-taking place. I’ll admit that I did cry my eyes out after ten minutes of just staring out and absorbing the view. I hope things are going well for you. Happy belated Easter! Hope all is well with Short Stack. Please let everyone know that I’m well and enjoying life. Look for a few more emails from me containing poetry. I have them in my journal, but I want you to have some for my May entries. Take care! I’ll be in the Amazon for 2 to 3 weeks… at most 4 weeks. It just depends on what the team leader decides to do. So, it appears she’s running around South America and enjoying every day of it. A part of me is so jealous right now, but I’m glad she’s getting a chance to explore. As much as I want to reply to her and nag about not having any pictures to see, I figured she’s probably on a borrowed computer. 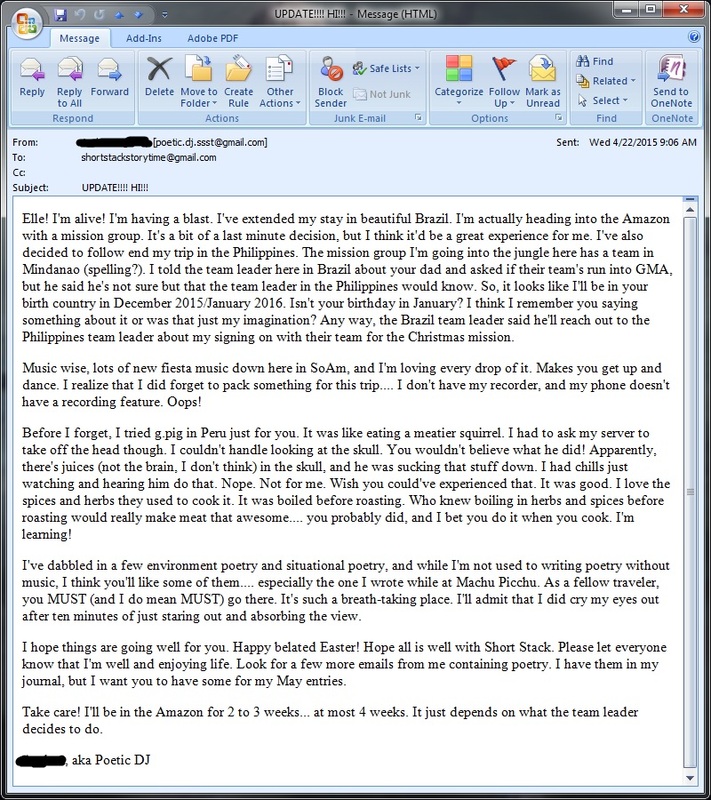 I’ve received two separate e-mails from her that’s poetry, and I’ll be publishing them for her on her Saturday slots in May. Pray for her safe journey into the Amazon jungle. I can’t believe she’s joined up with a mission group. I wonder what kind…. This entry was posted in Journal and tagged amazon, brazil, DJ, in my head, machu picchu, mission, peru, Poetic DJ, south america, traveling, update. Bookmark the permalink.